EasyLanguage methods are pieces of ‘in-line’ code (i.e. they are not in a separate program, like a function) that are called from within the program. They can call themselves recursively (see tutorial 95 where a method is used recursively to do a fast sort of a vector). It can be a good way of organizing code and potentially using the same functionality several times in a program. If you subsequently found a bug in the method then it would only need to be fixed once. In all three cases, the method calculates a linear regression and draws a linear regression line. I have recorded three videos, one that explains each version of the method. 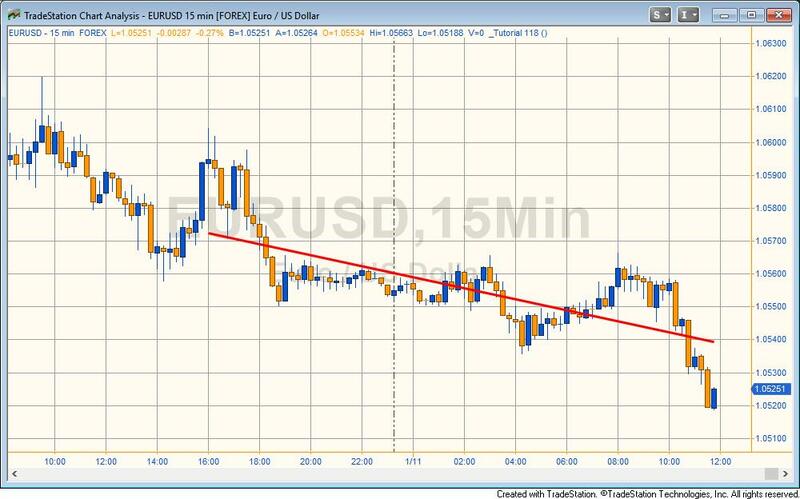 Tutorial 118 applied to a 15 minute EURUSD chart. The linear regression is applied over 80 bars. Tutorial 118 calculates the linear regression using the same calculation as tutorial 45, which includes a full explanation. The method has the following inputs: int StartBar, int NumBars, string LineColor, int TLWeight. StartBar tells the method at which bar to start the calculation. If it is set to zero it starts the calculation on the most recent bar. If it is set to 3 it starts the calculation on the 4th most recent bar (the count starts on zero). The NumBars parameter tells the method how many bars to use in the linear regression calculation. LineColor is a string which determines the color of the linear regression line to be drawn on the chart. TLWeight determines the weight of the the linear regression line to be drawn on the chart. The value can be set between 0 and 6. Gold Pass members may copy the code from the Gold Pass area below for free. Make sure that you are logged into your Gold Pass account. The UNPROTECTED TradeStation indicator containing the three methods (two of which are commented out) (i.e. the TradeStation EasyLanguage is fully functional and you can see the source code) are available for IMMEDIATE download for $19.95- by clicking the ‘add to cart’ button. After download the programs can be opened, you will be able to see the program code and modify it if you wish. Note that the program names begins with an underscore.